Move in meditation or with wild abandon and then put pen to paper and let the dance continue. Come dance, play and explore - new possibilities, dreams and hopes are just waiting to be discovered. In the dance we listen to what lies within; we nurture and tend to our soul's longing. We explore uncharted waters, daring to feel fully alive and to express our creativity. There are no steps to learn and no right or wrong moves. We dance our own dance and let joy arise freely. Whether you love to dance, write and express yourself freely or you freeze at the very thought of it -in this course you'll practise embracing and silencing the inner critic. Move in meditation or dance with wild abandon, then put pen to paper and watch the words spring forth. 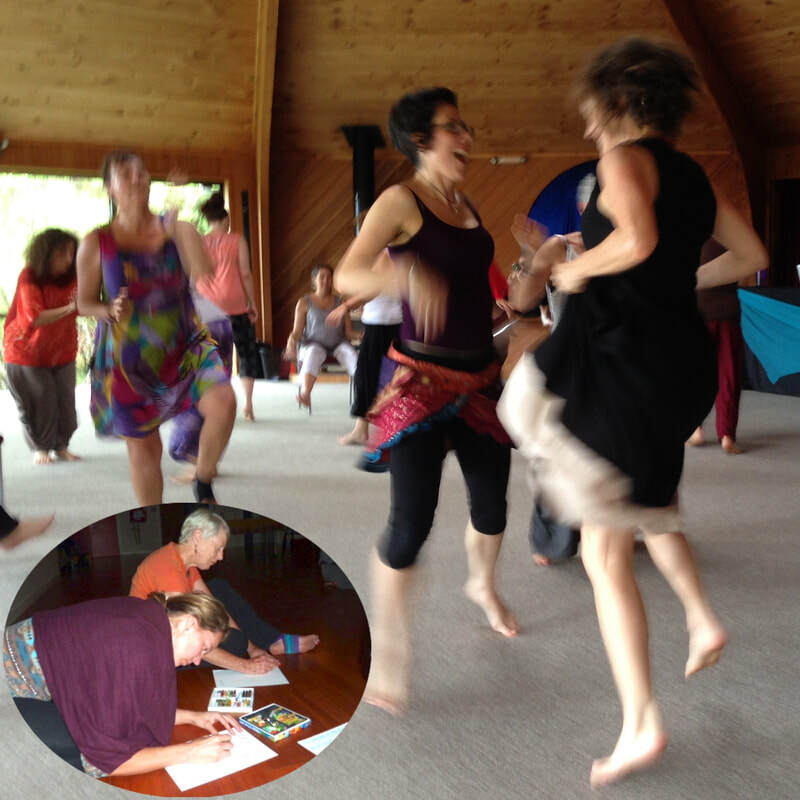 Learn practical and magical ways to inspire your writing and hone your dance. Tap into the wisdom of your body and let it tell its stories. Listen, dance yourself free and let yourself be surprised. No need to be polished or clever - nothing to make up and no skills or experience required. Come just as you are and join others doing the same. All sharing is optional! Do you love to dance, write and express yourself freely or do you freeze at the very thought of it? Dance your words onto the paper in this course where you'll practise embracing and silencing the inner critic. Move in meditation or dance with wild abandon, then put pen to paper and watch the words spring forth. Learn practical and magical ways to inspire your writing and hone your dance. Tap into the wisdom of your body and let it tell its stories. Listen, dance yourself free and let yourself be surprised. Bring a pen, a journal, a bottle of water, and wear comfortable, layered clothing. 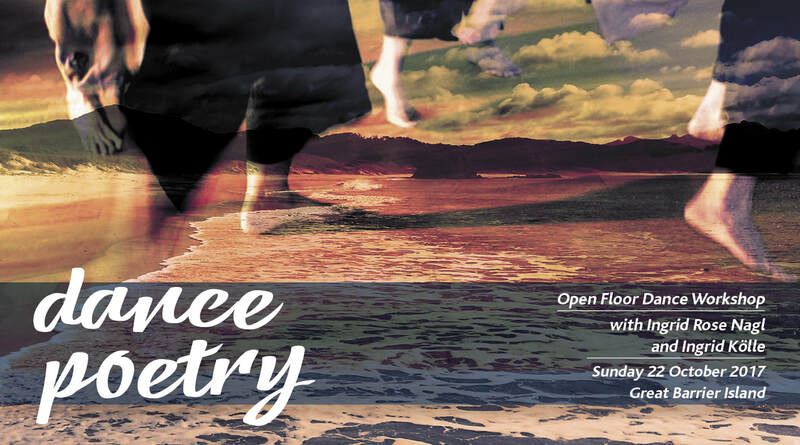 to register go here: "Dance and Write"
A Core Connexion/Open Floor dance session for all ages. Experience the simple joy of free movement. Dance yourself and the world alive! There are no steps to follow and you can do no wrong. Listening to and sensing our bodies we follow its internal movements and give them expression. A great variety of music and rhythms inspire the dances – slow ones as well as wild and exuberant ones. If you can move, you can dance. Children are welcome but must come with a supervising adult. This is a class for all ages and experiences. Children are welcome, but they must be accompanied by parents or caretakers. They can float in & out of the dancing or play in the kids’ corner where there will be art supplies & pillows. The session starts at 3pm. Please try to arrive on time to give yourself a chance for a slow warm up. You're encouraged to dance your own dance, helped along by gentle guidance and some fun activities. No experience necessary, just a willingness to move and be moved! a water bottle, wear loose comfortable clothing, and dress in layers. we dance barefoot or in clean dance shoes only. A fusion of two creative expressions: dancing and writing. Whether you love to write/dance or freeze at the very thought of it, let yourself be surprised by an effortless stream of words flowing from your pen. Let movement free your body and words dance on the page. Being gently guided into the dance, we move and open to the silent whisperings of the body. There is nothing to make up, no skills required. It's all about embracing whatever happens, on the dance floor and on the page. Do you think you can't write/can't dance? Silence that inner critic, take one step after another and move like you've never moved before. Put pen to paper and watch the words flow onto the page. All without effort. 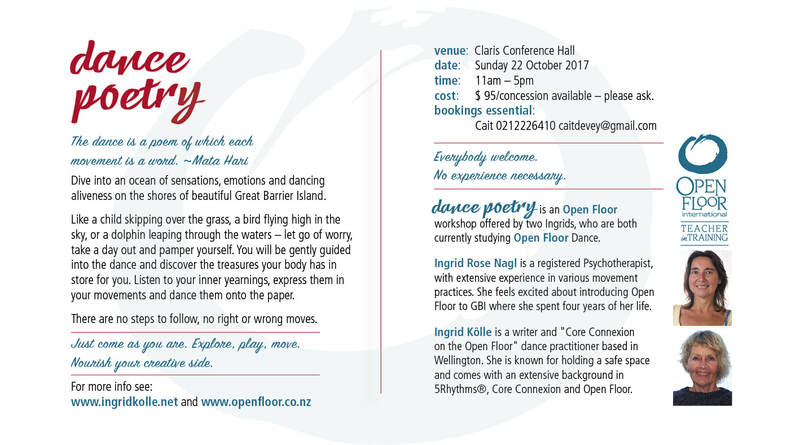 In this workshop you will learn practical and magical methods to inspire your writing and hone your dance. Our bodies remember everything we've experienced. Tap into this knowledge and write from the body, let the body tell its stories. Learn to listen, dance yourself free and unleash the stories within. We will move freely from dancing to writing and back to dancing. No need to be polished or clever. No experience required. Come just as you are and join others doing the same. All sharing of any writing is optional! No booking necessary, just show up! If you can move you can dance.